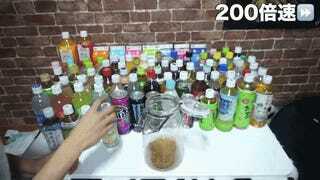 YouTuber Hajime spent 56,365 yen (US$475), buying every kind of non-alcoholic drink his local convenience store sold. Then, he mixed them together to make "infinity coffee." Oh dear. 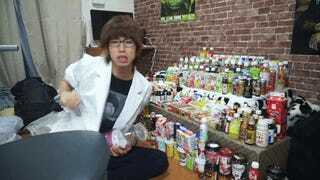 As pointed out by Twitter user Tim Hornyak, Hajime's video shows the huge collection of beverages amassed. 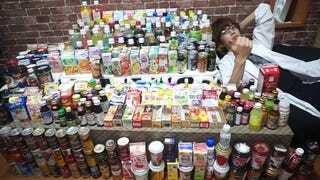 There were milk drinks, various types of canned coffee, soda, fruit juices, yogurt drinks, energy drinks—you name it. He bought one of everything the store carried, save for booze. Hajime points out that he bought all the drinks late at night when the convenience store wasn't crowded so as not to disturb other customers during the day. "I didn't steal 'em!" 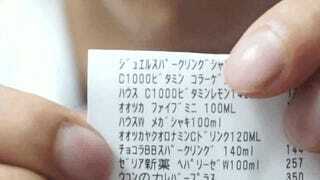 Hajime joked, showing off his receipt. He then got very excited, saying, "I'm going to change history!" 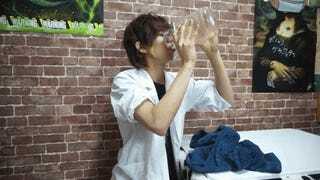 Hajime started with the dairy drinks, putting a straw full of each in the jar. 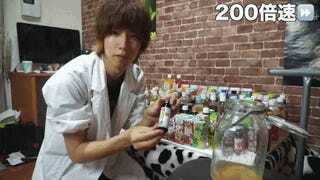 He put energy drinks into the mix, too. And a huge variety, too. 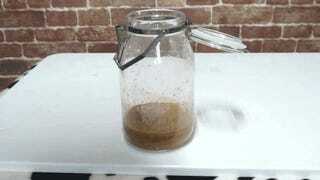 What's the resulting concoction called? And here's a good look at said "Infinity Coffee." 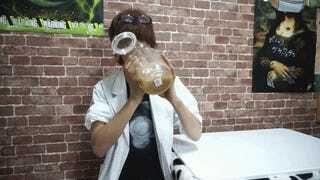 According to Hajime, it smells of ceylon tea, darjeeling tea, orange, peach, and, um, energy drinks. In short, "It stinks." 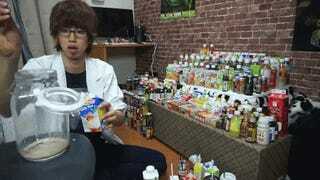 "It's bad, but not that bad," Hajime said, adding that it doesn't taste like it'll make you puke or anything. 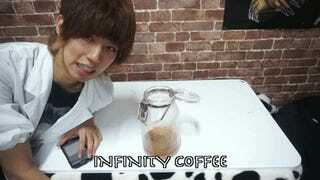 So, there you have it, Infinity Coffee is drinkable. Unless you have too much, that is.